When older homeowners are ready to say goodbye to paying their mortgage every month, they should consider getting a reverse mortgage. Doing so will allow the homeowner to pay off their traditional home loan by using their home’s equity. The answer is simple. You get to pay off your existing mortgage. That means no more worrying about a monthly mortgage payment ever again. What does it take to get a reverse mortgage? The homeowner must be at least 62 years of age or older and have sufficient equity on the house. The size of the loan depends on a few things: the value of the home, age of the homeowner, and the amount left over to pay off the house. Also, as stated previously, the owner of the home must still pay property taxes and insurance. It’s good to have the options because although many homeowners choose to pay off the mortgage immediately so there are no worries about monthly payments, others like to have other options in case there is a medical emergency. 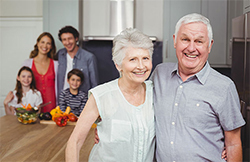 There is a large misconception that getting a reverse mortgage gives away your rights to the home. This is far from the truth. Seniors can feel comfortable with applying for a reverse mortgage loan because your name still stays on the title. The house is still rightfully yours and no one owns it but you. What happens to the home when the homeowner leaves the home? The loan needs to be repaid. In the unlikely case the homeowner owes more than the house is worth, the federal government pays the shortfall.